Shared Inspiration by Jill Jacobsen: Surprise!! No, I'm not back from my cruise yet, just set up a little special for you while I am away!! This is cool fold, it was on Splitcoast called Blintz Base, it's an origami fold. It really shows off the DSP well. The bottom part is a new die from Spellbinders. 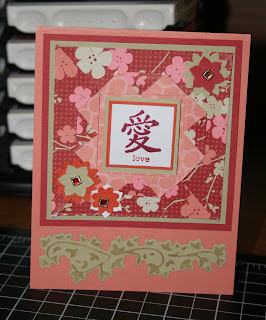 I used the River Rock and sponged on the cardstock with the same ink before I removed it from the die. I love the ivy. I used the Chinese symbol from Sparkle N Sprinkle, and the love from SU's Flexible Phrases. The cardstock is Groovy Guava, River Rock, Ruby Red, and Tangerine Tango. I embossed the symbol with Cherry EP from SnS.